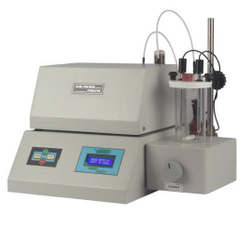 Fischer Titrator designed for accurate estimation of moisture contents in various samples. This is a junior version of the Model VEEGO/MATIC-MD. LCD Display. The end point of the titration is indicated by an audio signal. The factor of the Karl Fischer Reagent and the Percent and PPM of the sample under test should be calculated manually using simple formula. The instrument is having built-in Validation and Calibration facility for dispensed volume. Teflon Clamp with Glass Beaker.